so it's about time that the 350 needs a oil change (first time after oil cooler install)...and all of the sudden there's this question in my mind....how do i get the oil out of the cooler without unmounting it . so i just need some input from you guys how you do a oil change with an aftermarket oil cooler installed. btw do you guys replace the oil lines running to the cooler at some point? 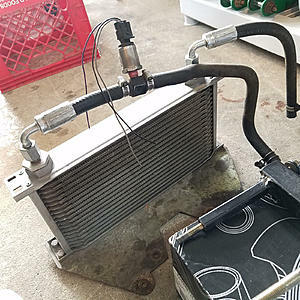 I am in the market for an oil cooler (been searching for the arc but no luck) this also never came across my mind until you mentioned. very good question. My SCCA 350Z racecar is equipped with a Setrab oil cooler. Even though this vehicle gets operated at, or near redline throughout the summer, I never drain the lines or the cooler itself when changing the oil/filter. If you're keeping decent intervals (under 4K miles), I don't see a big reason to do so. Oil supply in the oil filter system is at most, a quart, and changing the other five quarts seems sufficient to me. Man, I thought I babied my car... Lol. That seems unreasonable to do every time to me. Blowing out all the lines with air is a big no no. Wouldn't that st as re your engine for a while till everything is filled up with oil after a dry start? +1 on not bothering with it. Just size your cooler appropriately and it wont be much of an issue. Technically no, as with a thermostatic adapter like the Mocal most of the oil bypasses the cooler until the engine reaches operating temperature. Since there is oil in the sump the oil pump gets oil through the filter and to the engine. Though it is true that air in the cooler circuit when forced out does get pushed through the system and aerated oil is not really a good thing. +1 definitely no compressed air. And fiddling with oil lines unnecessarily is asking for trouble. I go as far as pre-filling both my filter and my cooler/lines as best as I can...I wouldnt overthink it. Last edited by bealljk; 10-01-2015 at 08:59 PM. thanks guys for all the input you it should be ok to just drain the oil as usually without touching the cooler. instead of starting a new thread, I wanted to just bring this one back up. Installing a oil cooler is on my list to do before next track season. I noticed the Mishimoto cooler has the the cooler installed with the lines on the bottom. Some other companies I've see the cooler installed with the lines on the top. What ways do you guys have yours installed and why? Ideally mounted so ports are on top or the side filling from the bottom up, but mounted on bottom should not be a problem. Just keep the lines safe, and remember to get your fill level correct. My ports face up. As dkmura summed up, draining the extra quart of oil shouldnt really matter if you keep your intervals up. Last edited by .:'3lio':. ; 02-02-2018 at 10:52 PM. Find More Posts by .:'3lio':. I just treat it like a normal oil change. I believe whatever oil is in the line is OK if its not drained. When you put new oil in that 1% of oil in the line is going to get mixed with 99% new oil. I don't have an oil cooler to comment based on experience but I would like to know since oil cooler def on my to - do list. If you run the lines in the bottom of the cooler some say it will cause the oil to drain and form an air bubble. However one line comes from the pump and the other goes to the engine. Both are fairly tight and should not be a problem if you drive the car at least once a week. Think about installing a small drain **** into the lines or if you mount the cooler on its side you would only need one drain. In any case, if you do not fill the pan with the same amount of oil the cooler contains it will be low by that same amount. picked up a used oil cooler for my 300, it has one already but it is kind of small so it is getting upgraded to a larger size. i will designate the OEM cooler for the transmission, just have to clean it really good before i run new lines to the transmission. plus it came with a good mounting bracket. Last edited by Dan Garcia; 06-12-2018 at 07:31 PM. i will designate the OEM cooler for the transmission, just have to clean it really good before i run new lines to the transmission. plus is came with a good mounting bracket.